There was an attempt to ID all the lamps in Deckerd's Apartments which stalled when Raz was unveiled. As far as I know only 3 have been identified. I've acquired the Dazor and World Fair Lamps on ebay and got out bid on a poor quality Lightolier. 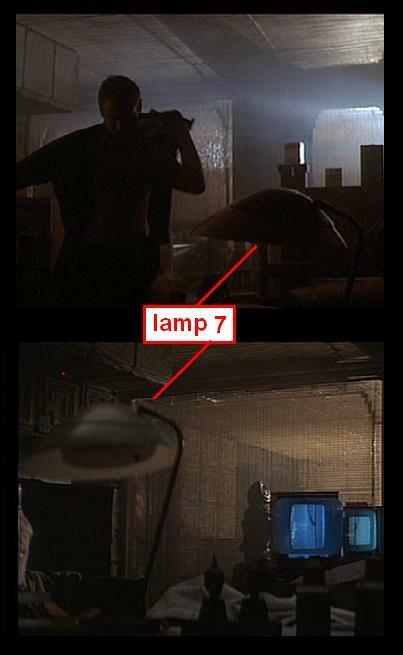 I'd be interested in further exploring the lamps and other set pieces in Deckard's apartment. Not necessarily to acquire as much as identify. If so, I think I have the screen grabs saved on my PC. Be nice to get some from the digitized release. I think the ones I have predated that release. I'll be glad to post if there is interest. 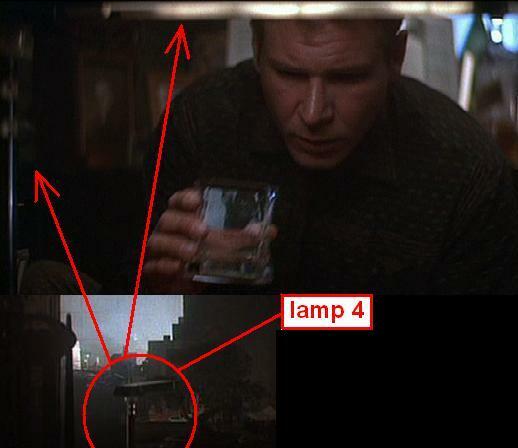 There are a ton of lamps in Deckard's apartment . I may have to try this task to take a break from the other stuff I am looking for. Screen caps would be awsome. I have not been able to do screen caps with any DVD software I have I think because of my video card. I used to buy lamps at garage sales and thrift stores that I thought had BR flavor. Many of them turned out to be very valuable and I sold them. None that I could tell were in the movie though. My most expensive was a Isamu Noguchi Akari standing lamp that I bought for $5. I sold it for $300. I like the idea Rick! The lamps are always something I enjoyed, but have always focused on the more notable props instead. I briefly searched a few times in the past for the lamps on ebay, but always came up empty. I found the caps of the apartment. They are actually archived at the RPF as well as on my harddrive! Duh! When I have a bit of time tonight, I'll drag 'em up and post them here. 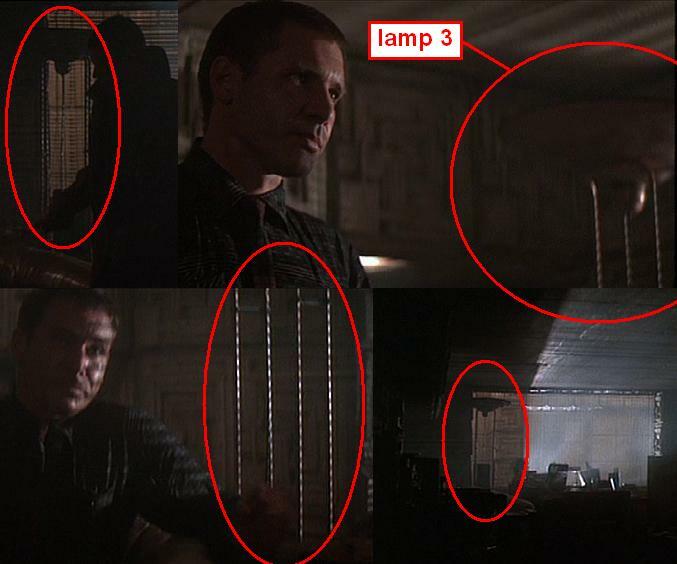 The main lamp I'd like to find at this point would be the floor lamp that sits behind Deckard as he talk to Rachel about her memories. 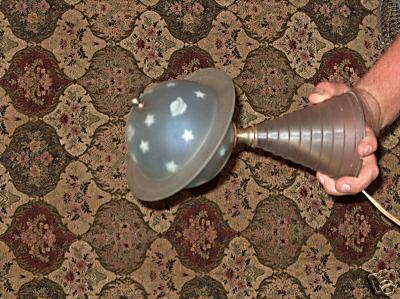 It has a saucer top and about three or four thin bars that make up the long body of the lamp. I've searched around a little bit but never a full force extended search. The main problem with looking for this lamp is that similar styles of lamps have been made for a long time which makes it hard to search for. The style is also ambiguous enough to making even dating the lamp difficult. Any thoughts or help on the search would be awesome! Jedirick- Not to be too nosy but how much did you pay for your Saturn Lamp? I still haven't picked one up yet due to the art deco collector's deep pockets. No problem! I got it for around $125 shipped I believe. The art deco crowd is more condition sensitive than I am. No way can I justify more than what I paid. Got the Dazor saucer , which I dearly love for a bit over $40. The saturn lamp has an internal crack about 2 inches long in the lower sphere half that is only seen from one slight angle. It works fine, displays well, and has all original parts. Frustrating thing is I saw a lower sphere section for auction about 5 weeks prior that didn't sell. Can't remeber the seller and as far as i know he has not relisted. That is a neat lamp. Are the bars twisted like wrought iron is sometimes done? Really be nice to get some higher res. 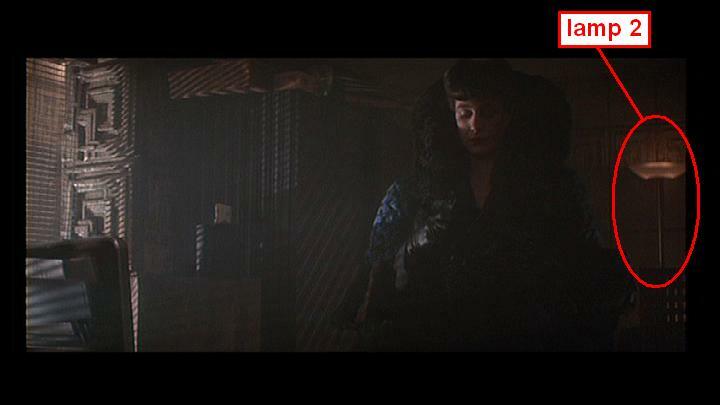 images off the digital edition. FLW did often design custom furniture for his buildings and both lamp 3 and 6 look like his style especially since 3 is incorporated into the wood bench which also looks like his style. I would have to agree toatlly with Igniters on this one. I suspected the same regarding Ennis House interior. However i have been assured the interior of the house was not used for filming. Only exterior. This links to a post I made in the RPF thread. Sadly the virtual tour has been pulled. I check periodically because if they come up again, I'll sure as heck find a way to save them. I found no furniture similar in style in any of the rooms. Goes same for lights Doesn't mean they weren't there at the time as some interior items seem to come and go. 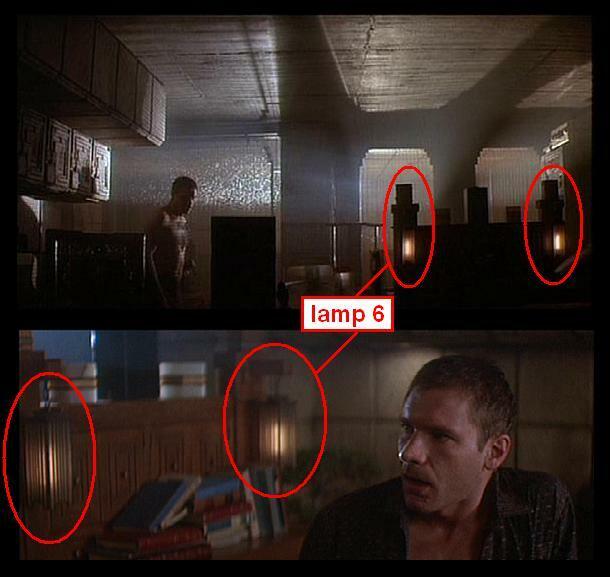 The interior Deckard Apartment shots are a studio constructed set. However the architecture of FLW does support the wood headboard style and lamps. Would seem FLWs style would be carried forth on set. 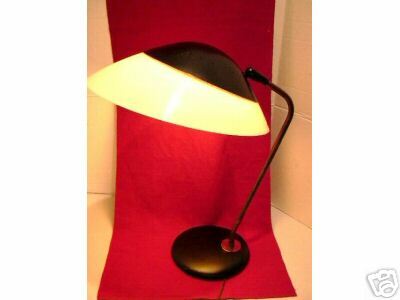 Also inline with Eames/Lightolier/dazor/Art Deco period. Number 3 may not be twisted/spiraled wrought iron. Look at the twists and then look at the first picture I posted just to left of Rachel. Thwe wall has similar barring from light. The light through louvered blinds in the apartment may be providing the diagonal slash that looks spiral like. 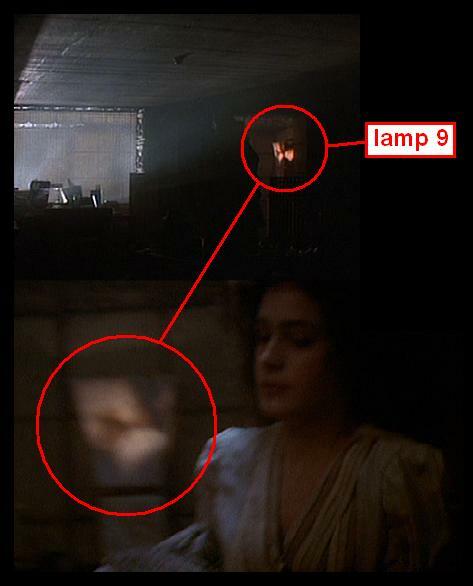 Number 9, IF it is a light, is probably mica or stained glass with a random coloration from Mother Nature or the glass makers vat. having rambled about a number of location shoots and sets. It's not unusual for permission to use exterior of a building is OK yet interior is not available. This applies a lot in the case of the Biltmore House in Asheville. 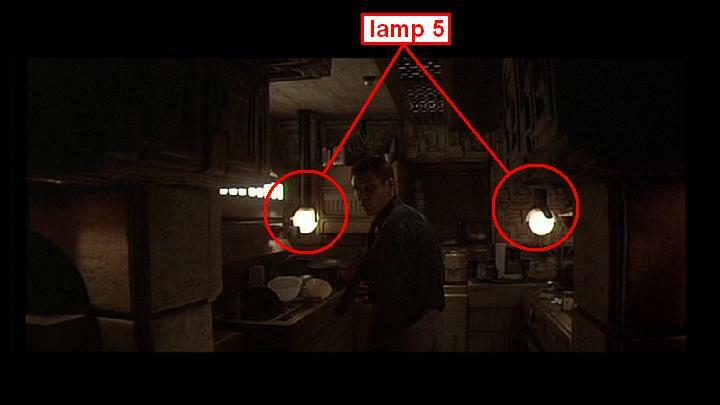 Most interior shots are actual constructed sets, while exterior is made much more available to filmmakers. The Ennis House has a history of on again off again as to restoration, tours and people actually living in the home. I know a decendant of the Browns (son?) was living in the home for a number of years spanning that period. Currently their official website is stagnant, gift shop closed and as far as I know tours are not being offered of the interior. I just hope the restoration process continues. One of these days i want to make the trip. I have heard the same about the apartment being bulit as a set too. At the same time I have seen pictures of the set layout that match floorplan of the Ennis house. It makes no sense to match them unless they used the house for some interiors too. I am not yet convinced either way. Good call on the shadows. I would have to agree 100% on that. I'm pretty sure Nick is the one that got me on that and he's pretty darn thorough prior to making claims. Mine was all based on assumption. I'd kill for those virtual shots or 30 minutes inside with a camera! Good luck Rick. There is another on now that is white and missing the vent grid from the top. I actually have a few dazor lamps and love their "industrial" quality. 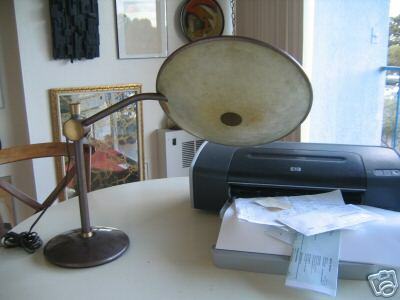 Always wanted one of the magnifying lamps. I have a couple of double neck desk lights and a different style of saucer lamp. well thats a drag ,I also ws waitin fer the end of that one ...dont know if yer bid was gonna be higher than mine but ...maybe in good faith I will back off this one ...I skipped past the last 2 due to funding issues. I can back off! No problem. I bid on it because it's the wrong color and I was going to use it in my den because I like the lamp! My reason for bidding early is because I suspect I have attracted a bid stalker on items doing with Harrison Ford. Figured if he went for this I'd know for sure! If either of you want to bid, go ahead! I think my max is $15.50 But PM me so i can cancel my snipe software which has a higher bid.